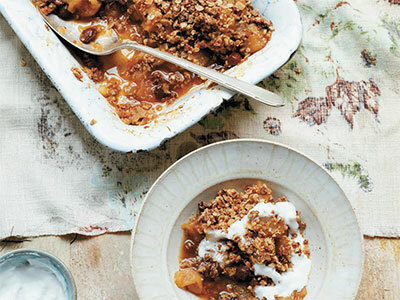 The mix of apples, pears, raisins and spices is so warming and delicious, while the spiced crumble topping is bursting with wonderful flavors and crunchy textures that complement the fruit perfectly. From Deliciously Ella Every Day. Start by making the fruit layer. Peel and core the apples and pears, then chop them into bite-size pieces. Place the chopped pieces into a saucepan with the cinnamon, ginger and raisins, plus enough water to cover the bottom inch or so of the pan. Let the fruit gently cook over medium-low heat for about 20 minutes, until it’s really soft. Preheat the oven to 400°F (convection 350°F). Meanwhile, make the crumble layer. Process the pecans in a food processor for about 30 seconds, until they form a flour. Tip into a bowl and mix in the oats and vanilla. Place the coconut oil, date syrup, ginger and cinnamon in a saucepan and gently heat the mixture until the coconut oil melts. Pour this into the oat mixture and stir it all together. Once the fruit has cooked, place it in a baking dish (mine is 12 x 8 inches) and spread the crumble layer on top. Bake for 20 minutes, until the top turns a golden brown. Serve with coconut yogurt, if you like. If you want to create something extra-indulgent, then try drizzling maple syrup across the top of the crumble once it has finished baking. It makes it extra-sweet and delicious! Delicious plant-based, gluten-free recipes and lifestyle tips for packed lunches, snacks, and simple meals that are easy and accessible to everyone—from the author of the international bestseller Deliciously Ella.It’s easy to be healthy until you get hungry. Making healthy eating sustainable is about two things. One: it’s got to be doable in the context of a time starved life. Two: it’s got to be delicious. Ella Woodward’s newest cookbook Deliciously Ella Every Day offers fantastically appealing and quick recipes for breakfasts, packed lunches, snacks on the go, and stress-free meals. 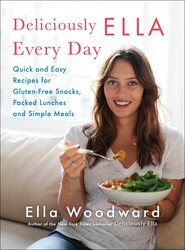 Ella Woodward is all about embracing healthy living. Ella’s debut cookbook, Deliciously Ella, is the bestselling debut cookbook ever in the UK and her app has been a bestseller for the last year. Ella’s blog gets over six million hits a month and she has nearly 500,000 Instagram followers. Her philosophy is all about showing that healthy living is fun and enjoyable; it’s not about deprivation or starvation.